Warmer weather usually means more rain storms and thus the potential for more rainbows as well. Virtually all of us should be aiming to consume a “Rainbow of Color” from nature’s color wheel when it comes to fruits & veggies. There are many health benefits associated with the colors of the rainbow nature so graciously provides, and particularly for those discussing prostate cancer prevention, incidence & progression, treatment, and survivorship as noted in the 4 part series we started late last month and will be continuing with this month. Beyond their beneficial vitamin content, consider the rich antioxidant & anti-inflammatory content of some deeply colored fruits & vegetables. How familiar are you with nature’s rainbow of fruits & veggies when it comes to matters of prostate cancer and actually overall health for anyone? 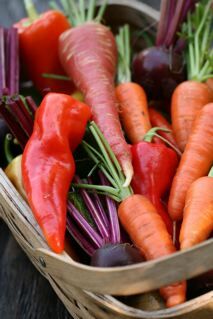 (Photo of basket of organic vegetables courtesy of Dahlia via rgbstock.com). ORANGE/YELLOW food items contain beta-cryptoxanthin. Examples of good choices from this color group would include nectarines, oranges, papaya, and peaches; some are also sources of vitamin C and flavonoids such as lemons, limes, oranges, orange juice, peaches, pineapples, tangerines. YELLOW/GREEN food items are rich in lutein and zeaxanthin. Examples of good choices from this color group of food items would include avocado, collard greens, green peas, honeydew mellon, spinach, and yellow corn. Take advantage of a local Farmers Market when you see nature’s fresh bounty in abundance, or if that is not possible, then seek out good quality frozen and/or canned vegetables with no salt added and no sauces added, etc., as usually those choices can be excellent sources of these precious substances as well.